It’s only mid-January and I’ve already had some setbacks on my journey to a healthier, stronger, size 8-ier Jacinda. I’m down 24 pounds since September but I’m at a bit of a standstill this month with all of the delicious rich comfort food that appeals to me when it’s colder outside. And I’m literally at a standstill when I think about exercising outdoors. It’s freezing out there people. I also have a family who is not on board with sacrificing delicious food for the sake of mom looking lean and mean on the tennis court. (Not an excuse, I swear!) So lately I’ve been studying up on ways to keep everyone happy at the table. Basically, how can I prepare healthier versions of the meals that my family loves so that I can feel good about not only serving food to them but also eating the dishes myself? Pretty Prudent: Hi Pam, Recipes like Buttermilk Oven Fried Chicken and Southern Grilled Trout from the Wholesome Fixin’s menu have me drooling. I know my family would love for me to prepare dishes that are not only healthy but satisfying and delicious. What are your 5 tips for making healthier versions of their favorite comfort foods at home? Pam: We all want our families to feel great and have energy and brain power –and most know that eating well is a good way to get there. But choosing and preparing nutritious food is a difficult and confusing task at best, and impossible to do on an everyday basis if the food doesn’t taste great. Wholesome Fixin’s offers dishes that are fresh, fun, flavorful, familiar — and below 600 calories — giving guests the home-style comfort food they crave, in a lighter style. We’ve counted the calories for our guests and carefully crafted items that are delicious, filling and satisfying by using our flavor toolbox. Our focus is NOT on what to leave out – but on what to put IN (taste, craveable flavors, texture, nutrient rich ingredients, ample portions). More than lower calories, each menu item is carefully designed to be healthfully balanced and in high quality and nutrient-rich ingredients — whole grains, fresh produce focused and beneficial fats. Wholesome Fixin’s makes the choice for healthier eating an easy one – because it’s delicious and craveable! • Roast it up! Roasting brings out the natural sweetness and flavor in meats, vegetables, stocks – even fruits – by deliciously caramelizing the surface of the food. Roasting chicken or vegetables before adding them as an ingredient to your comfort food dish takes it to a whole new level. And oven roasting can also work flavor magic on foods that are traditionally fried. • Spice and Smoke it up! When grilling meats or vegetables, you can simulate the deep flavors that are developed in roasting by using spice rubs — adding another layer of craveability as the rub caramelizes on the surface of food with the heat. If the spice rub contains a touch of smokiness, such as smoked paprika – even better… taking the place of bacon and such in dishes. A little sweetness added to the rub – such as maple sugar or sugar in the raw blocks bitterness in the dish – even working wonders with making suspect veggies like Brussels sprouts more family-friendly. • Butter(milk!) it up! Buttermilk is a heritage Southern food that has come into the limelight of flavor — and health. Together with yogurt, these probiotic filled fermented foods are culinary superstars – adding acidic high notes to balance dishes, tenderize and preserve moisture in meats, serve as a creamy base for salad dressings and become a perfect “glue” for breading chicken, fish or meats before baking or frying – such as Buttermilk Oven Fried Chicken. Our Southern Grandma’s were culinary geniuses! Veg it up! Vegetables added to traditional comfort food dishes such as Chicken and Dumplings, Meatloaf, Salmon Patties, Pot Pies, Hash – even burgers – adds bright flavors and texture to dishes, not to mention a wellness boost (often undercover!) They also add moisture and crave. For example, roasted mushrooms added to meatloaves or burgers brings out “umami” and moisture in the dish but are totally disguised. And topping a grilled meat or chicken with a vegetable relish or salsa adds pizzazz and sizzle! • Cream it up! Pulling from all the above tips – using vegetable (cauliflower, butternut squash, potato), bean or nut purees to thicken and cream soups and sauces gives a beautiful and nutrient-rich velvety texture. A touch of Greek yogurt or buttermilk does the same creamy work, beautifully replacing mayo or sour cream in a dish. Cooking oats in milk of your choice results in a creamy and satisfying oatmeal breakfast. It’s all about Great Food – that’s Great for You! Pretty Prudent: These are amazing tips for preparing healthier versions of the foods we love at home. Now let’s talk about Cracker Barrel. 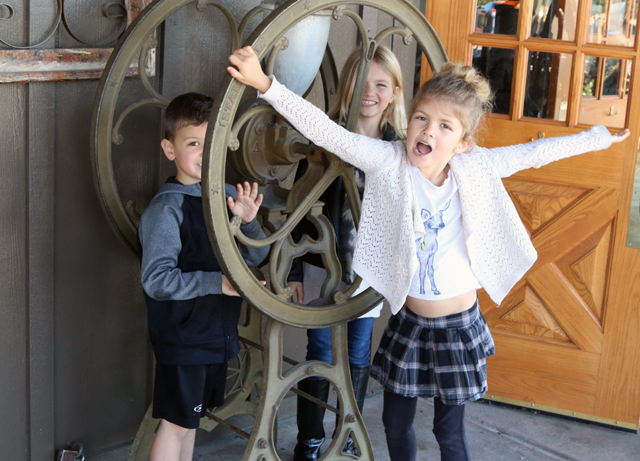 I just brought the kids in for a Sunday lunch and we had a wonderful experience. The staff was amazing, the environment was so lively and fun and the food was tasty and satisfying. Do you mind if I ask you a few more questions while I have you? Cracker Barrel is known for their comfort food. In creating their Wholesome Fixin’s menu, what was important to consider as you worked towards developing healthier dishes that would still appeal to their customers? Pam: Creating dishes that were fresh, fun and flavorful but most importantly familiar. We didn’t want customers to have to count calories or go into a clinical mode so we counted the calories for them and carefully crafted items that were delicious filling and satisfying. Our “flavor up toolbox” puts focus on what to put in versus what to leave out. Often focus is on removing the sodium or fat or calories but we focused on adding in flavor instead of taking the bad stuff out. For example, with the Buttermilk Oven Fried Chicken we marinate boneless skinless breast in a buttermilk herb marinade which tenderizes and gives texture and because buttermilk is a fermented food it becomes a glue for the crumb topping. We then oven roast it. The crumb topping is loaded with spices that have smokiness to them and depth of flavor but doesn’t rely on excessive fats or sodium. Eating it gives the same experience as traditional homestyle fried chicken. Pretty Prudent: What items on the menu seem to be the most popular so far? Pam: It’s really fun because instead of the place that people would normally go on the menu, they are making the choice to pick the healthier options from Wholesome Fixin’s. Instead of the homestyle chicken, they go for the Buttermilk Oven Fried Chicken. 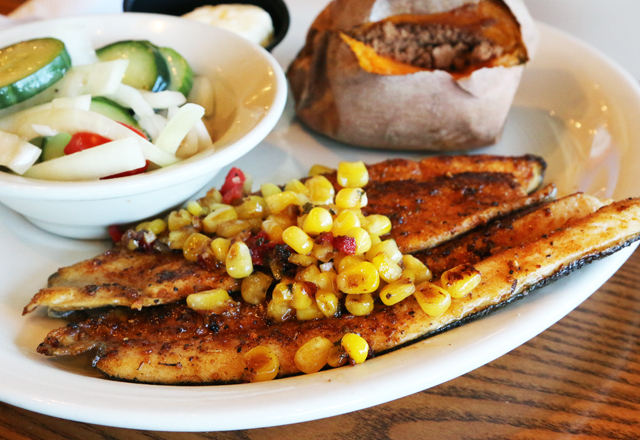 If they generally like fried fish they would try the smokey Southern Grilled Trout, which is delicious with a smoked paprika spice rub (a good replacement for the smokiness and flavor of bacon or sausage) then it’s grilled. So it is still caramelized then it’s topped with a corn relish. 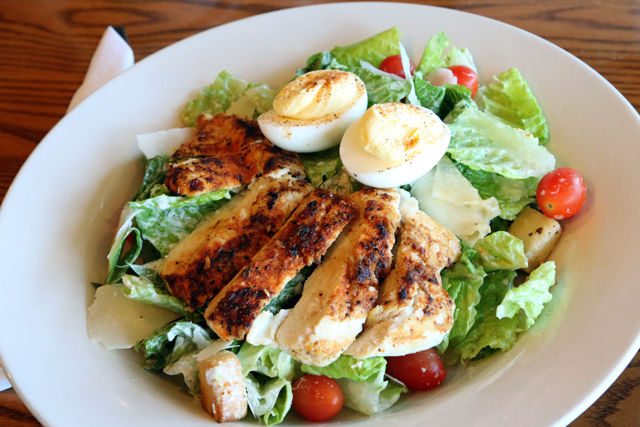 One that is a stand out go-to popular is a smokey southern chicken on our Southern Grilled Chicken Caesar Salad, which has the same spice blend as the trout. The salad is made with a buttermilk Caesar dressing, which is lower in fat and calories and comes with deviled eggs on the salad instead of in the dressing. Very popular. 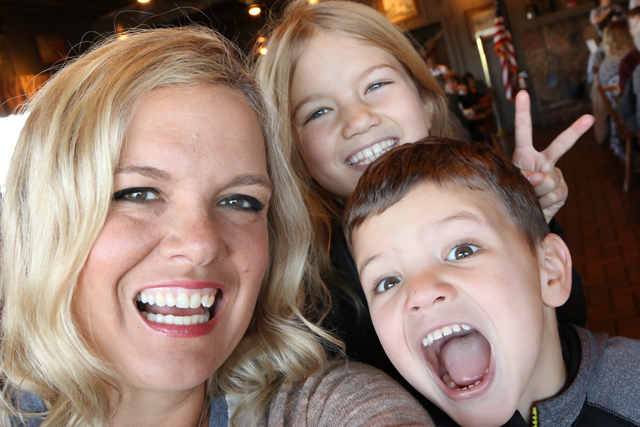 Pretty Prudent: When I’m traveling, I like to have new food experiences but sometimes it’s most convenient and comforting to have a familiar option like Cracker Barrel, especially when hungry kids have been on the road. 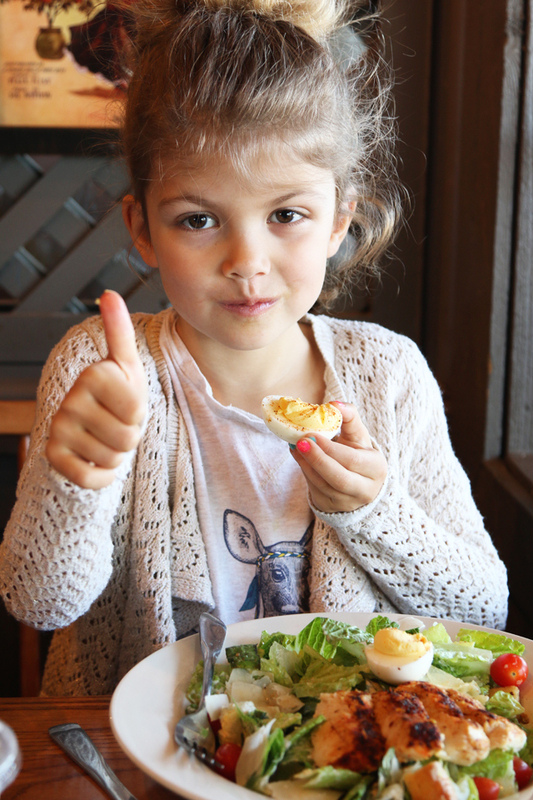 What tip do you have for parents who are trying to get their kids to make healthier choices too when they make a stop at Cracker Barrel (or any restaurant) on a long trip? Pam: Go with familiar foods – kids love chicken tenders so to be able to do a similar texture and crispiness with the Buttermilk Oven Fried Chicken is a great route. 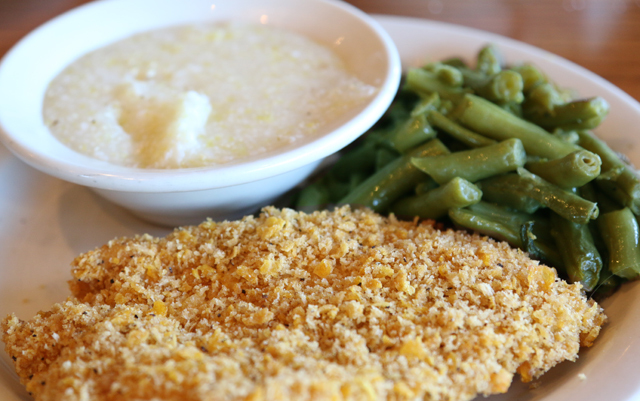 There are 33 different sides at Cracker Barrel, so choose healthy sides. 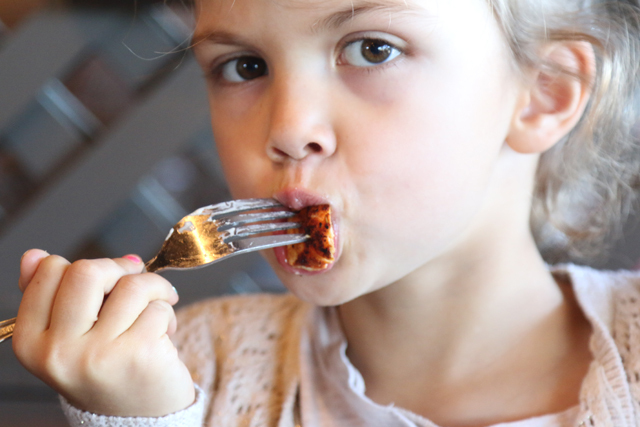 Kids are not limited to the usual sides at many restaurants like french fries or mac and cheese. 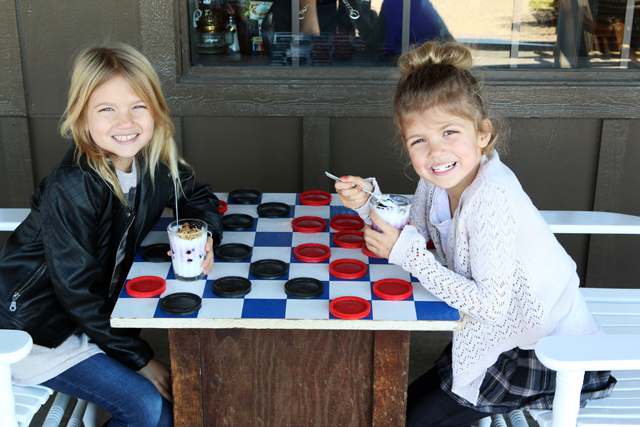 Kids can choose from the 33 sides not just fries or mac and cheese. The sides are better than other restaurants, for example broccoli is marinated in a vegetable broth to give flavor to steamed broccoli. Fresh fruit… turkey bacon vs regular bacon… Brown rice pilaf… great things that are quick and easy for the kids but a little bit of an ability for mom or dad to make better choices. 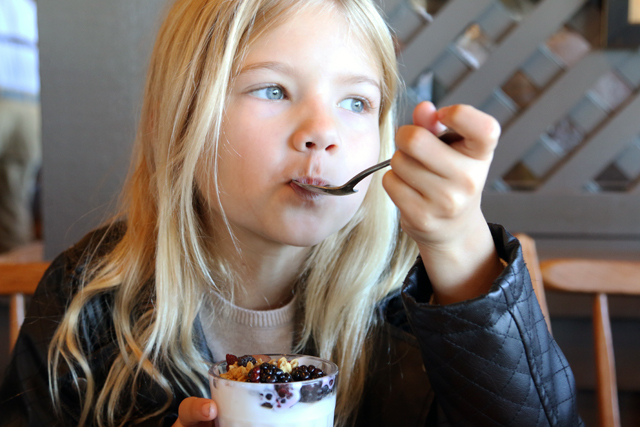 It’s great for kids to be able to be excited about eating at a fun restaurant and have the homestyle experience, but also have the variety of healthier choices. 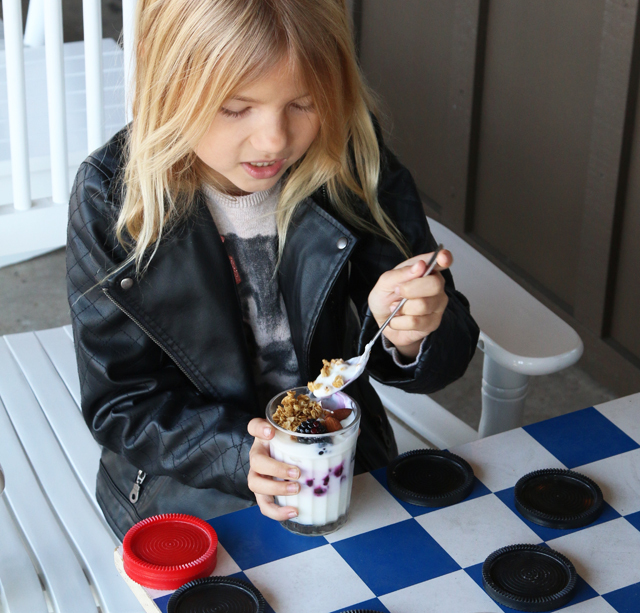 Fresh Fruit n’ Yogurt Parfait in the mason jar is extra fun. 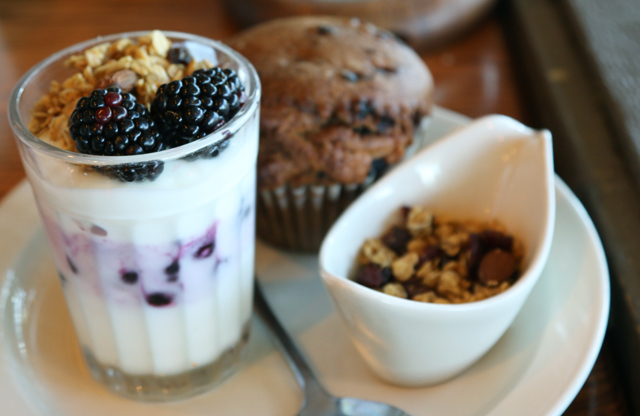 Pretty Prudent: With dishes like the Good Morning Breakfast, Oatmeal, and Fresh Fruit n’ Yogurt Parfait on the new menu, it’s clear that you put an emphasis on starting your day with a healthy breakfast. What advice do you have for families who are trying to be better about eating a wholesome and fresh breakfast before they head off to school and work? Pam: Don’t leave home without breakfast. It makes all the difference for energy and brain power that last as long as the day lasts. But also recognize mornings are crazy and frenzied. Try making a mason jar parfait with Greek yogurt and all fruit jam, or steel cut oatmeal with milk (protein) and apple juice so its creamy and sweet with no added sugar. Both can be prepared in advance and refrigerated. For an indulgent comfort food that is healthier, make a multi grain French toast because it has eggs (protein) and instead of regular syrup make a berry sauce. You can also grill it in advance and put it in the freezer, then pop them into the toaster in the mornings. The eggs keep the bread moist so it’s crispy on the outside and moist on the inside even after being frozen. Pretty Prudent: Thanks Pam! We are inspired to implement your expert tips at home. 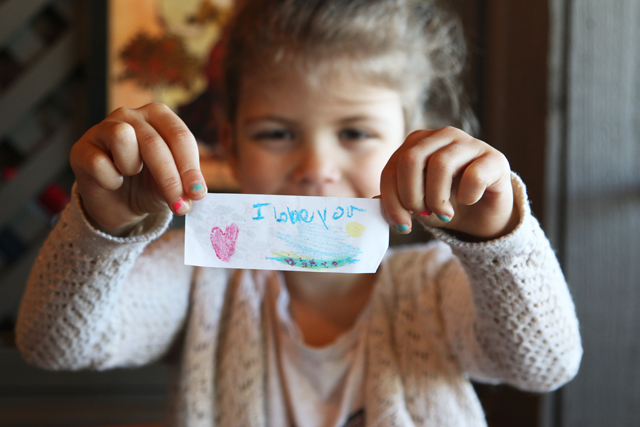 There is no better way to show our families that we love them than by sharing a meal that we can all enjoy together. Here is to a healthy, happy, and satisfied 2016! This post is sponsored on behalf of Cracker Barrel, all opinions are our own. It’s like you are in my mind! All I want is comfort food and soup because it’s so cold! I had no idea I could use creamed veggies to add creaminess to soup and keep it healthy. Genius! I’m so doing this tomorrow, I’ve got some pounds to lose. Thank you! Wow! This article is awesome. Great tips. I want the buttermilk chicken NOW!!! !